Violinist Esther Yoo plays OST of film 'On Chesil Beach'. September. 15, 2018 08:11. summer@donga.com. Attention-gathering rookie violinist Esther Yoo held a special event for her fans in Korea. The 24-year-old violinist started playing violin at the age of four, praised as a prodigy to grow to make a debut on a concerto stage at eight. She garnered global attention by becoming the youngest to rank third and fourth, at the International Jean Sibelius Violin Competition in 2010 and at the Queen Elisabeth Competition in 2012, respectively. As the first performer of Korean ancestry, she was selected to become BBC’s New Generation Artist for three consecutive years from 2014 to 2016. Currently, Yoo performs as the first ever artist-in-residence with the Royal Philharmonic Orchestra. 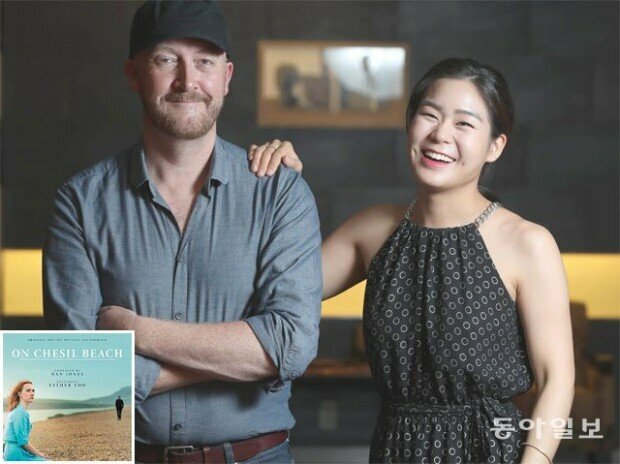 Even with a busy schedule, Yoo has traveled all the way from her house in Belgium to Korea as she is in charge of performing OST of the upcoming film "On Chesil Beach" to be released on Thursday. The movie is a film version of a novel with the same title by Ian McEwan. Previously, in 2001, the film "Atonement," based on his novel, was released, ending up with a great box-office record and positive reviews from critics. The romance movie "On Chesil Beach" depicts a couple deciding to break up on their wedding day and later unveiling the secrets of love. The film was dramatized by Ian McEwan and starred by Saoirse Ronan, nominated for the Academy Award for Best Actress twice, putting itself at the center of attention. Esther delivers a variety of subtle and sophisticated emotions encompassing joy, sadness, sorrow and compassion by playing her Stradivarius made in 1706. Dan Jones served as a music director for the movie. The British Oxford-educated composer is one of the pioneers in computer-aided music. Yoo decided to play for the film "On Chesil Beach" as she had a long-time affection toward movies from her early ages, she said. However, she said it was not as easy as she would think. She explained that performers play music according to their own interpretations while movies are supposed to translate the female character’s feelings and emotions as well as the director’s thoughts and philosophies. Nevertheless, she added that cooperative works were amazing, leaving the violinist with lessons helpful to her performance. At first, Yoo thought that she would play three pieces, ending up playing the whole set of 23. The music director said in an interview that he wished to ask her to play the whole OST as he was well aware that Yoo is a young artist-in-residence with the renowned London Philharmonic Orchestra. He recalled that it only took two days for her to record all the songs, adding that her passion and enthusiasm surprised staffers. In response, Yoo answered that she pulled all-nighters and skipped meals to analyze music scores for a week. It was one of fresh experiences for her, but it made her realize that nothing is impossible, she confessed. The violist has watched the final edited version of the movie as many as eight times, saying that the results are satisfying. “I met the actors at promotion events. They praised me for doing a great job of adding music befitting the movie. I was told that Mr. McEwan, known for his sophisticated taste of music, really loved OST,” she said. The collaborative music is also available as an album by DECCA Label. The U.S.-born and Europe-educated violinist loves having new experiences. She also has a wider interest in other types of music than classics, which may imply that she wants to come closer to Korean audiences by playing various types of music.